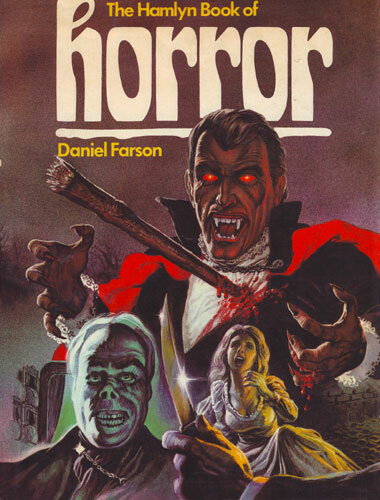 Daniel Farson - Hamlyn Book Of Horror | Vault Of Evil: Brit Horror Pulp Plus! There was a Beaver paperback edition of this horror starter pack in 1977, but this hardcover version seems to have been a fixture in the kids section of just about every public library in London (and elsewhere?) well into the eighties. I picked up at least two scribbled over ex-lib copies before finally landing one in decent nick. Why bother? It had plenty to do with the - uncredited - illustrations (pretty strong, notably a bulging-eyed zombie and a rather unsettling two-pager depicting the Beane clan in action) but the clincher for me was and is the author's slick way with a narrative. Farson, or to give him his full name, "Daniel Farson, great nephew of Bram Stoker, author of Dracula", authored books on the Ripper and The Man Who Was Dracula so no surprise to find the King Vampire biting a huge chunk out of the Horror Stories section (Frankenstein, ]Dr. Jekyll & Mr. Hyde and various works of Poe dominate the chapter but there are welcome short entries on Bierce, Victor Hugo, Le Fanu and M. R. James) and Saucy Jack effortlessly trashing the opposition - Countess Bathory, Vlad, Stranglers Of Bombay, Sawney, Ivan the Terrible, Rasputin, Haigh - in Real Horrors. Likewise, the strange goings-on in a North London cemetery seem to have been something of an obsession with him and this wouldn't be the last time he'd turn to his press-cuttings for inspiration (wait until we get on to Transplant). It's just a pity he didn't write a real Hamlyn Book Of Horror - an appreciation of the nasties published under that imprint. Ah, that cover brings back memories. As a Dracula-daft youngster I spotted it in Boots in Glasgow and, as Christmas was approaching, made it pretty plain to my mum what I wanted from Satan... er... Santa. Come Christmas day I was delighted to find that my subtle hints had been picked up on... then discovered I'd also been given Dennis Gifford's "Pictorial History of Horror Movies" and completely forgot about Mr Farson's tome for a bit, fickle child as I was. Things I remember from it were discovering for the first time that there was a real historical Dracula, Sawney Bean, stories of someone's corpse being so tall they had to break the legs to get it into the coffin (think this might have been a Stoker relative), and my first encounter with a figure with "an intensely horrible face of crumpled linen". Some of the illustrations are surprisingly strong for a youth market book, notably that of Vlad the Impaler locking a horde of peasants in a hut and torching it. Dan Farson was the subject of a touching Daily Telegraph obituary, Television interviewer, writer and photographer who turned into a monstrous drunk in his beloved Soho (29 November 1997). I found his book on 'fifties Soho in the local library yesterday but - bloody typical! - i'd forgotten my ticket . I still have my handbacked version of this, purchased from WHSmiths in Worksop. I ADORED this book. 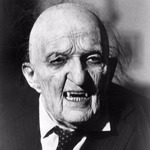 It was my first introduction to people like Montague Summers, Bram Stoker, etc. I found the real-life horrors section terrifying. The artwork is superb. I used to try to copy the illustrations into a tatty exercise book that I pretended was my own novel.